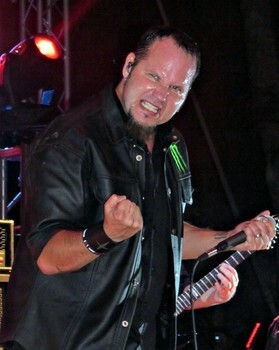 Tim Ripper Owens is, of course, the former singer of Winters Bane, Iced Earth and Judas Priest. Since his firing from those last two acts the vocalist has busied himself with Beyond Fear, Yngwie Malmsteen and now his official namesake solo group. This album had a lot of potential stylistically. Owens has assembled a genuine all-star cast that should and could have delivered the goods, but there are several nagging factors leading to the album only scoring an 'average' grade here at Metallian Towers. So, what are we dealing with here? Straddling the line between hard rock and traditional heavy metal Play My Game hits the jackpot with the style of its songs. Think of the material as traditional with a nod to Sacred Heart era Dio, late '70s Judas Priest and Iced Earth as guidelines. The musicians are such that should they have all gathered in one studio to record and the mallcore mafia (average age 9 of course) detonated a bomb the heavy metal world would have suffered its biggest blow ever. Aside from Tim’s Beyond Fear and Winters Bane buddy, John Comprix, the album features contributions from Jeff Loomis, Simon Wright, Rudy Sarzo, Carlos Cavazo, Doug Aldrich, Ellefson, Tony Franklin and more. So, what has gone wrong? An easy answer would be the participation of Korn’s Ray Luzier on drums. What the crony of corporate rock is doing here amidst the luminaries is anybody’s guess. Unfortunately, easy answers are not always the best answers - unless you are a right-wing douche bag (forgive the redundancy) that exists in a simple world full of stupid profundities - and as obtuse as the appearance of an Adidas-rock dimwit is this album has other problems. The biggest of these is the song writing. One can count three entertaining and superior songs on the album. The first of these is the album’s opener - and oddly enough semi-power ballad - Starting Over. Tim and company hit a few powerful notes and riffs on the song that immediately whets the appetite for more. One has to go through the entire album, and suffer through songs like The Light, and on to the last two songs, Death Race and The Shadows Are Alive for some more serious action. More speed, heaviness and power kick in on these two tracks where things pick up. Unfortunately, and by implication, that means that the middle of the album is fodder for the filler litterbin. One too many songs here startle in a bad way, namely that how could so many experienced and smart people do so little for a song’s ability to be metallically heavy or action-packed? Incidentally, things pick up in tandem with the songs’ tempo here. The prized few faster parts work really well for Tim, but regrettably there are few of them on the album. This takes one back to the beginning of the review and the argument. Tim Ripper Owens is slowly coming across as someone who is committing all the mistakes he can in a hurry. He is apparently focusing on quantity instead of quality. Could there be one too many chefs at play on this album? Similarly, is Ripper taking revenge for his firings from Judas Priest and Iced Earth by going mercenary and making as much money as he can in as many bands as he can with as many performances as he can? Tim is not receiving good advice from his manager - whether that is himself or someone else. He may be making money in the short-term with his scattershot approach, but what are all these weak songs doing for his legacy and reputation? The fact that he would go from the band of one megalomaniac guitarist to another’s really says it all. As for Ripper’s own voice not only is he still at the top of his game, but also given a free rein he has had time to record as many takes and dual-voices as he so chooses all of which come over in the songs. All is in order in that realm.